Representative Honours: Ireland: 1 Amateur Cap (1931); Irish Free State: 7 Full Caps / 2 Goals (1930-1936); League of Ireland. Club Honours: (with Bohemians) League of Ireland Champion; FAI Cup Winner 1934/35; League of Ireland Shield Winner. * all league games, both spells; # all other games, both spells. An ex-pupil of Wesley College Dublin, multi-talented sportsman, Fred Horlacher excelled at Gaelic football, water polo*, tennis, swimming and golf. Initially a goalscoring inside-forward with Bohemians, his long career with the club saw him take the field in every position bar goalkeeper. His form won him selection for both the Free State and the IFA-run Ireland Amateur side. He played in a famous 3-1 win over England Amateurs in 1930, much to the chagrin of the FAI who suspended him for three months. 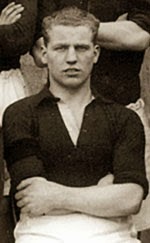 Bohemians top goalscorer during their amateur era, Horlacher died of pneumonia in 1943, just six weeks after announcing his retirement from playing. Summary: 1/?. Won 1, Drew 0, Lost 0. Summary: 6(1)/2. Won 3, Drew 0, Lost 4. * Horlacher may have represented Ireland in water polo at the Olympics. Clarification is required.